Are you so excited that it is spring? I know I am. But I am also realistic and know that even though it is "officially" spring, it is not going feel like spring here for a little while. There are still a few more weeks of potential snow storms and cold weather and then there is mud season before we really get to spring and things growing and green. And plus there are still plenty of roots to finish up before we get into all the fresh spring veggies. You can't plant broccoli and pea into frozen snow covered soil. I love me some root veggies, they are some of my favorite, although like every year around this time I am starting to tire of them. But what are you going to do? 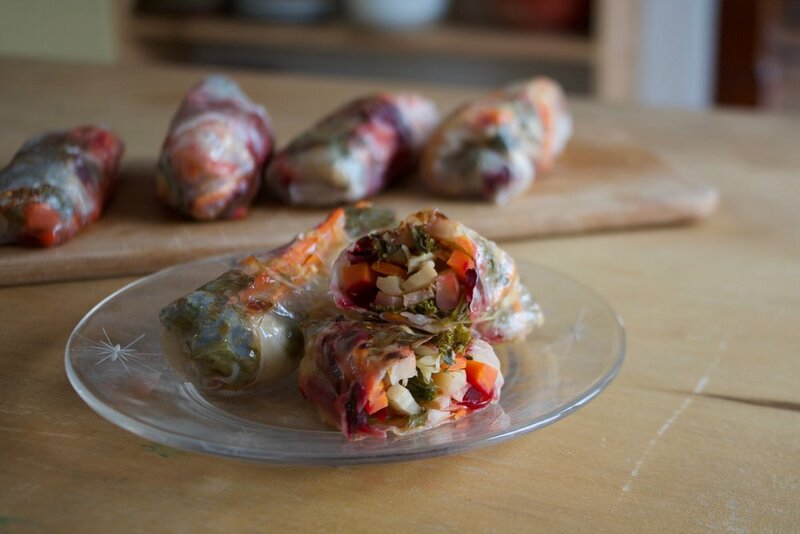 Stop complaining and stuff them into a spring roll with some lighter veggies and enjoy while you can because once the roots are gone, they are gone (until the fall). 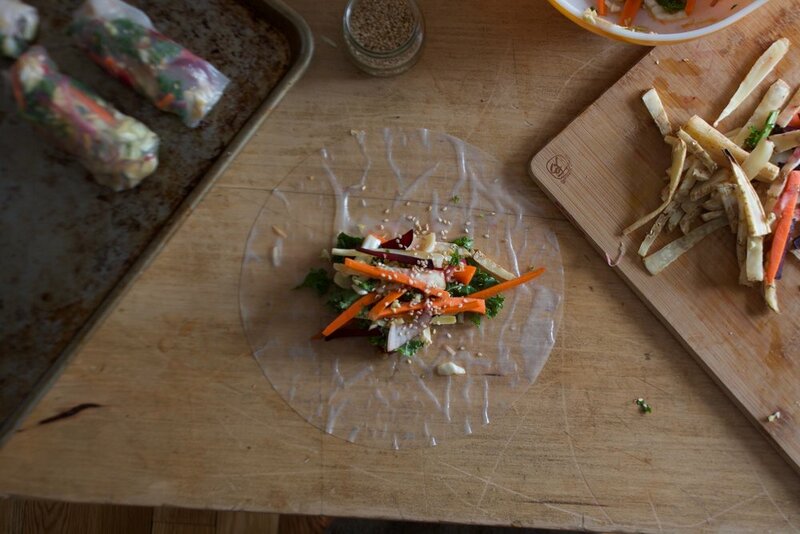 These spring rolls are good, I mean really really good. The combination of the roasted roots with a fresh tangy mixture of crispy crunchy veggies and fresh ginger and soy and they are just really good. When I made these, it was still vey cold outside so I even went an extra step and baked the rolls to give them a little crispiness to the wrapper because crispy warm food is kind of nice when its cold out. Because it is still cold out. The stuff. 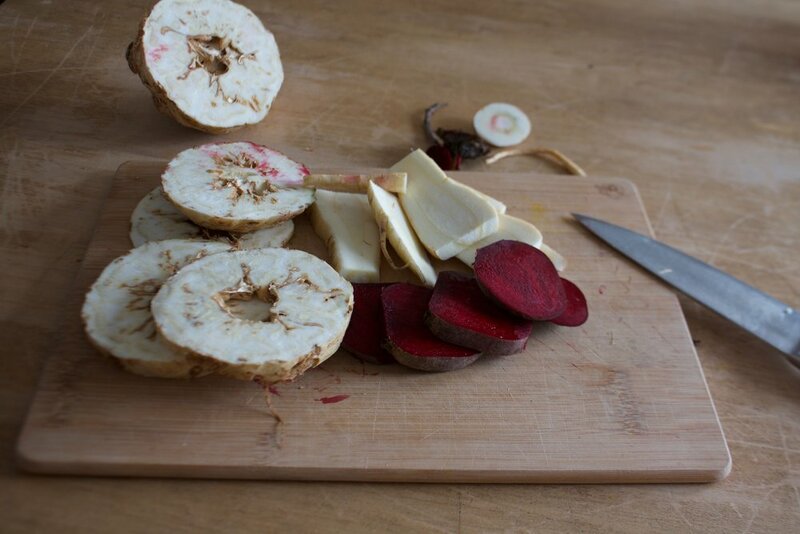 For roots we are using beet, celeriac, parsnip, and carrot. 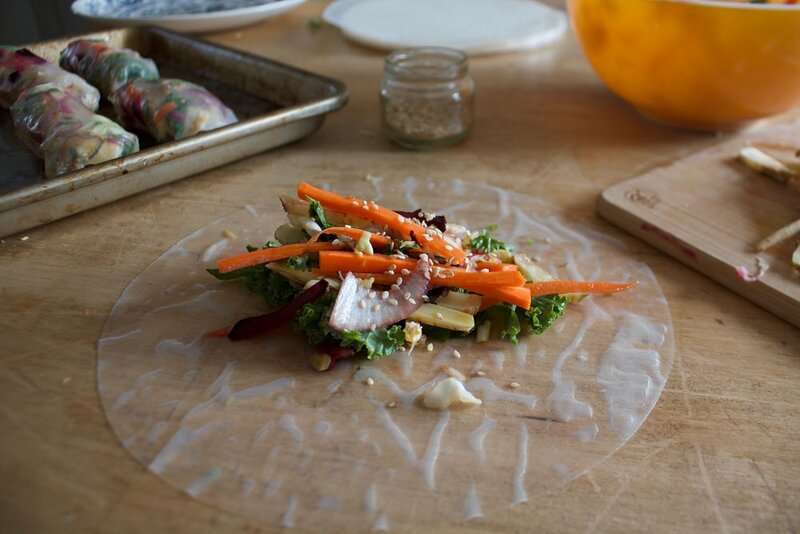 Then we need onion, kale, cabbage, garlic, fresh ginger and rice spring roll wrapper. Also some sesame seeds, soy or tamari, apple cider vinegar, and a little oil or avocado oil. First thing to do is get the roots roasting. Cut the roots into !/4 inch thick disks and place right onto a lightly oiled baking sheet then stick into the oven to roast until browned and tender. As soon as the roots are in the oven, chop the kale nice and small. Thinly slice the onion and the cabbage and mince and grate the ginger and garlic. Cute the carrot into very thin matchsticks. Don't be gentle, toss with your hands. You can lick then after too. Roasted and cooled roots get a nice matchstick chop so they fit into the rolls. About time for assembly time. 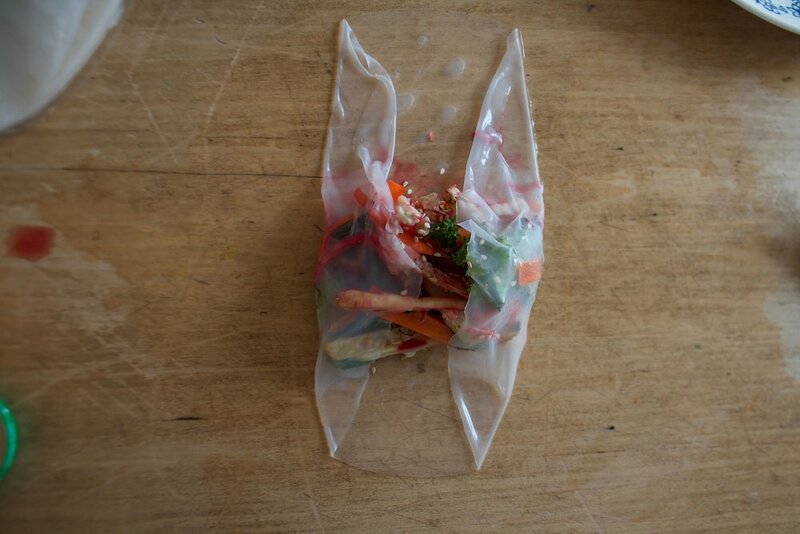 Damp wrapper with a pile of the cabbage, kale, carrot, onion mixture and a few pieces of each of the roots topped with a sprinkle of sesame. Oh so pretty all waiting to be wrapped up. Fold sides over, fold bottom up, and roll nice and tight. Easy peasy. Place the rolls on a lightly oiled baking sheet. Lightly brush each roll with a little oil as well and stick them into the oven. After 10 minutes, flip them over was bake for 8 or so minutes more until both sides are lightly crisp. And the they be done. Eat right away and serve with extra soy sauce. See, we are still happy to eat our roots. And spring veggies will be here before you know it. 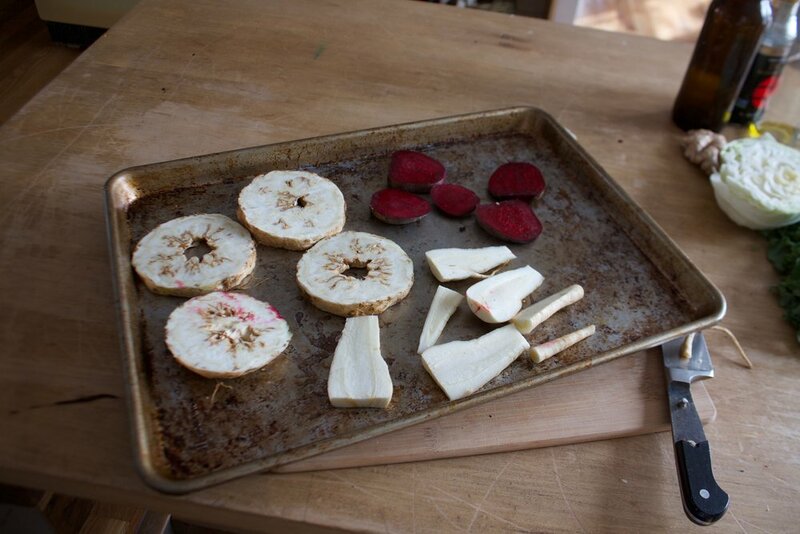 Slice the parsnip, celery root, and beet into 1/4 inch thick disks and place on a lightly oiled baking sheet. Bake for 15 minutes, flip, then bake for 10 or so more minutes or until the veggies are browned and tender. When the roots are in the oven, thinly slice the cabbage and onion and toss into a bowl. Chop the kale into small pieces and thinly slice the carrot into matchsticks about 2-3 inches long. Place it all into the bowl with the grated ginger, minced garlic, vinegar and soy sauce. Toss it all around and let it sit while the other veggies are roasting. Once the roots have cooked, remove form oven and let cool. Keep oven on. When they are cool enough to handle, slice the disks into matchsticks 2-3 inches long. 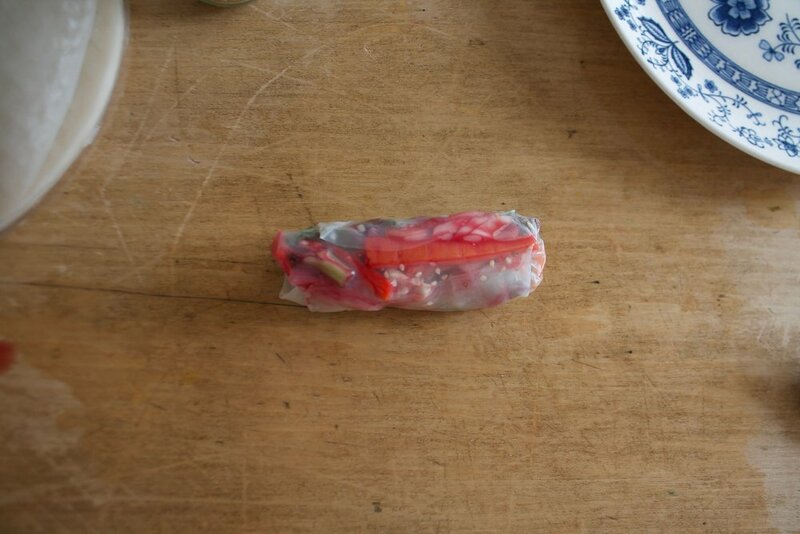 Take a shallow dish that can hold a little water and is big enough for a wrapper to fit and add warm water to it. Keep your baking sheet from the veggies close and lightly oil it again. 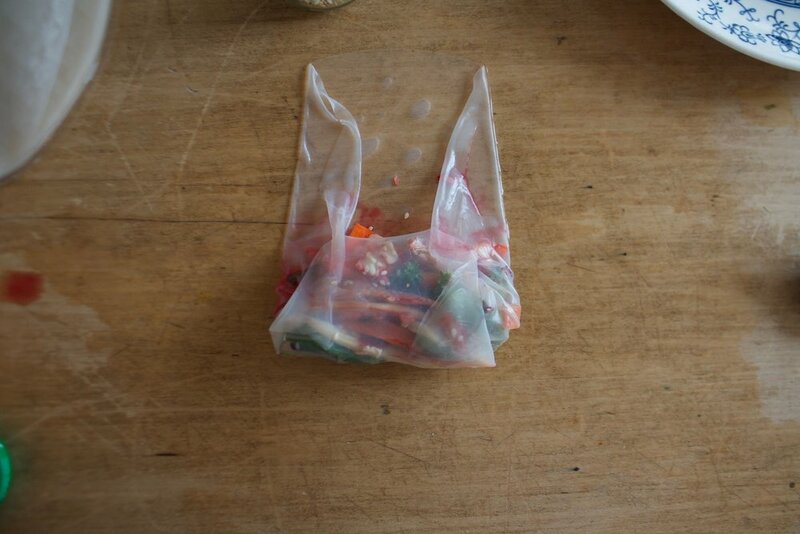 Place a wrapper in warm water then place on a wet surface. 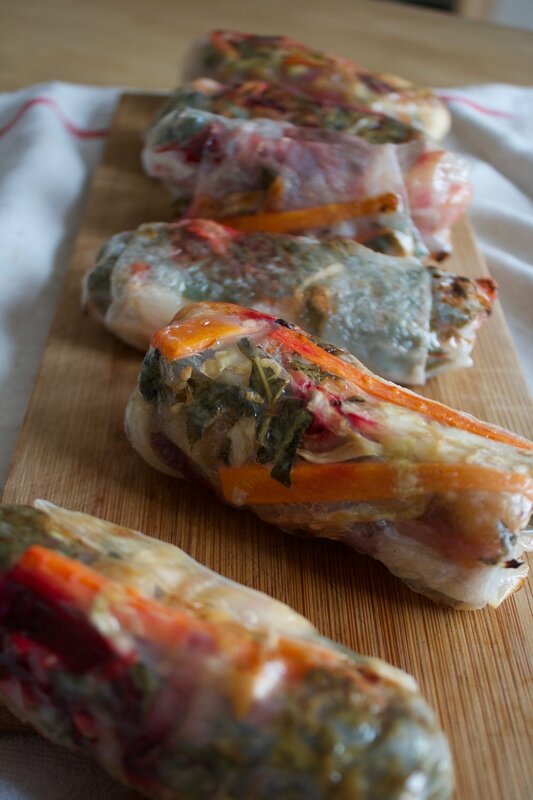 (keep surface slightly wet or the wrapper will stick) Add a good pinch or so or the cabbage/kale/carrot veggie mix into the center of the wrapper then add a few of each of the matchstick roots on top. Sprinkle with sesame seeds and then roll. Once rolled, place on baking sheet. Remove from oven when each slide is lightly crispy and serve right away, preferably with more soy sauce to dip in.